Regenerative Prolotherapy is useful for treating soft tissue injuries other than the classic joint sprain injuries. In this light, Prolotherapy has been practiced under the name of “Sclerotherapy” (and variations of that theme) since the days of Hippocrates—that is two millennia! As such, Sclerotherapy has become a time-honored treatment and a cure for many developmental and acquired soft tissue lesions—including soft tissue cysts. Illustration of a Baker’s cyst. Along with the vast multitude of maladies that beset the human condition, there are benign, soft tissue cysts. These include a huge number of different kinds of developmental and acquired cysts of virtually every tissue of the body. Amongst those are the popliteal or, so-called, Baker’s cysts of the knee—which are “not infrequently” encountered in musculoskeletal or orthopedic medicine. Occurring in the hollow behind the knee (i.e., the popliteal space), Adams generically described these popliteal cysts in 1840.1 Baker more clearly delineated these cysts in 1877 as “synovial cysts in the leg in connection with disease of the knee joint” and which, he reported, were often associated with the bursa of the semimembranosus tendon.2 Now, these popliteal cysts are named after that same Dr. William Morrant Baker. Morphology: In adults, a Baker’s cyst characteristically involves a protrusion of the knee joint space lining (i.e., synovium) producing a posterior bulging into the popliteal space behind the knee. This popliteal cyst usually arises between the tendons of the medial head of the gastrocnemius and semimembranosus muscles, posterior to the medial femoral condyle. It often extends (dissects) into one or the other tendon, more often that of the semimembranosus. For years the earliest clinical literature associated the popliteal cyst with involvement of the semimembranosus tendon and bursa. With the advent of more sophisticated imaging techniques, however, these cysts more characteristically reported in association with posterior meniscal tearing—often accompanied by knee arthritis and/or loss of articular cartilage. 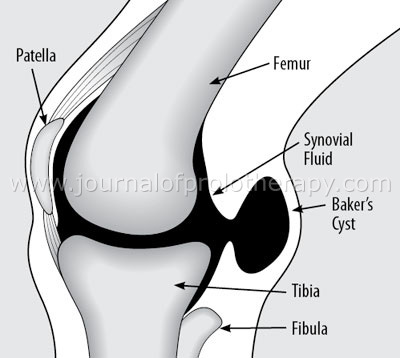 The fluid-filled cyst almost always maintains an open communication with the knee joint space via the meniscal tear. On occasion, the joint-space/cyst-space communication may become obliterated by spontaneous articular tissue healing. In any case, the space-occupying cyst ultimately becomes a swollen mass lesion in the popliteal space, reducing knee range of motion, creating stiffness and pain, and impinging on nearby vital structures. Natural Complications: The pressure of the swollen popliteal cyst may compress and partially occlude the popliteal vein causing secondary, lower leg edema and true deep vein thrombosis (DVT). Occasionally, the cyst may actually rupture, producing acute popliteal and lower leg pain, swelling, and redness—adding to the challenge of the differential diagnosis. 1. Deep vein thrombosis (DVT) with thrombophlebitis (i.e., especially differentiating DVT from the calf pain, swelling, and redness of an acutely ruptured popliteal cyst). Just leg rest, ice, and elevation may suffice. Instead of ice, a heating pad may help some individuals. Avoiding squatting, kneeling, heavy lifting, climbing, running, and any other activity that puts strain on the posterior knee may be helpful. Specific physical therapy and other body work (e.g., Rolfing, Pilates) may be helpful in stretching the hamstring muscles and conditioning the quadriceps and its tendons. Ace bandage compression and bracing of an unstable knee may be helpful. An actual knee brace, however, can further compress the already tender popliteal space. NSAID medication has been reported as fleetingly helpful if there is any substantial inflammatory component. Cyst aspiration (drainage) may be curative. Cyst drainage and injection of corticosteroid into the cyst space have been reported, again, as helpful if there is an inflammatory component—still, albeit, only fleetingly. Surgical excision is mentioned but should be held in reserve for only the most extraordinary of cases. Our main intention is to familiarize both Physician and Patient with the history, basic concepts, and language of Prolotherapy—as well as whatever literature exists that provides a base of evidence confirming its clinical efficacy. With this article, we would like to stimulate reading and increase the general level of understanding of Prolotherapy (or Sclerotherapy) of Baker’s cysts—as well as to stimulate interest in improving private clinical and academic research evidence of the efficacy of such treatment. Please use Google and the website for the National Library of Medicine (www.pubmed.gov) to access the following and other articles on the internet. Thanks to the publisher, the following article is readily available in its entirety by searching for it by author and subject via Google. Sclerotherapy of Baker’s cyst with imaging confirmation of resolution. Centeno CJ, et al. Pain Physician. 2008 Mar-Apr;11(2):257-61. Centeno, et. al. (2008), presented an “isolated case report” of treating a 52-year-old male patient for Baker’s cyst—the patient’s general history being classic, as previously described. The main objective of this single-case management report was to observe whether the already recognized curative effect of Sclerotherapy on a Baker’s cyst could be verified by MRI imaging changes. Initial conservative treatment of the patient’s right popliteal cyst consisted of NSAID medication; drainage of the swelling, once a month, for three months; along with physical therapy. Each drainage was performed posteriorly and produced about 40cc of clear serous fluid, causing 1-2 weeks of symptomatic relief of pain and stiffness. Then the swelling, pain, and disability would resume. Because of persistent recurrence of the cyst and its symptoms, the authors began three monthly combined treatment sessions, consisting of complete drainage and proliferant-sclerosant injections. Within four months of initiating this combined treatment, the patient reported decreased cystic swelling, pain, and range of motion disability—albeit he continued to experience medial knee pain attributed to residual meniscal injury. This article definitely presents descriptive MRI evidence, including radiophotographs, showing cyst resolution following treatment. Perhaps a source of confusion, however, is the interspersion of the two terms, “Sclerotherapy” and “Prolotherapy.” The term “Sclerotherapy” is in the leading title. Then, “Prolotherapy” is used seven times and “Sclerotherapy” or “sclerosing” are used a total of eight times. “Prolotherapy” is used in the abstract conclusions and the major heading, “Utilization of Prolotherapy Agent.” Then, “Sclerotherapy” appears in the main article conclusion. It is still arguable between the two camps of Prolotherapists and Sclerotherapists as how the healing of the subject patient’s popliteal cyst might be explained. Sclerotherapists might look at the glass as half-empty and say that the scarring occurred subsequent to the sodium morrhuate’s causing an inflammatory reaction that stimulated fibroblasts to lay down new collagen, creating a fibrous scar, adhering the cyst walls, thus, closing down the cystic space—ergo, a “scarring” phenomenon reminiscent of the scarring of a skin wound. In the end, it all amounts to being the same healing process—the details of the explanation just depending on how you hold your tongue in your mouth when you say it. The real explanation is that there needs to be a randomized, double blind study to demonstrate the microscopic cellular healing process and confirm the degree of efficacy. As interesting as the original article is, the two “Letters to the Editor” accompanying the article are arresting, as well. In the first letter, Felix Linetsky, MD, richly complements the Centeno article with a very informative short history of Sclerotherapy, leading to the development of Prolotherapy. He describes the transition of early Sclerotherapy of soft tissue lesions, such as hernias and cysts, leading to the more classic applications of modern-day, musculoskeletal Prolotherapy. His listing of historical references to Sclerotherapy is of definite historical value. Also, Dr. Linetsky extends this Centeno, single-patient experience by adding a thought-provoking suggestion as to how “Sclerotherapy” might be useful in treating the cysts often found anteriorly to painful zygapophyseal, facet joints of the sprain-injured cervical spine by performing intra-articular facet injections. In the second letter, Doctors Pinnamaneni and Thomas of SUNY Upstate Medical University provide some interesting historical facts about the earliest reports of Baker’s cysts along with citing some information on certain theories of the biomechanical derivation of such cysts. Also, they comment on how important it is that proper MRI imaging of a Baker’s cyst should reveal the cyst’s communication with the knee joint. In their response, Centeno, et. al., demonstrate that they had, indeed, confirmed MRI study evidence of joint-cyst communication. Finally, the SUNY correspondents go on to raise skepticism that “Prolotherapy” (not mentioning “Sclerotherapy”) could really be the direct cause of the cyst’s disappearance. Unfortunately, it seems that these investigative clinicians failed to grasp the difference between “Sclerotherapy” versus “Prolotherapy” as the two techniques were employed in the management of this single-case—possibly due to the way the management plan was reported by Centeno, et. al., in this relatively abbreviated article. Adams R. Chronic rheumatica of the knee joint. Dublin J Med Sci. 1840;17:520-523. Baker WM. On the formation of synovial cysts in the leg in connection with disease of the joint. St. Bartholomew’s Hospital Reports. 1877;13:45-261. Bui-Mansfield LT, et al. Baker cyst. eMedicine. 2009. http://emedicine.com/article/387399. Sansone V, et al. Popliteal cysts and associated disorders of the knee. Critical review with MR imaging. Int Orthop. 1995;19(5):275-9. De Maeseneer M, et al. Popliteal cysts in children: prevalence, appearance and associated findings at MR imaging. Pediatr Radiol. 1999;Aug;29(8):605-9. Ward EE, et al. Sonographic detection: comparison with MR imaging. AJR Am J Roentgenol. 2001;Feb;176(2):373-80. Alternative treatments. Dealing with chronic pain. Mayo Clinic Health Letter. 2005;4:1-3. Personal communication with Dr. Centeno. 30 November 2009. Sackett DL, et al. Evidence based medicine: What is it and what it isn’t. BMJ. 1996;312:71-72.